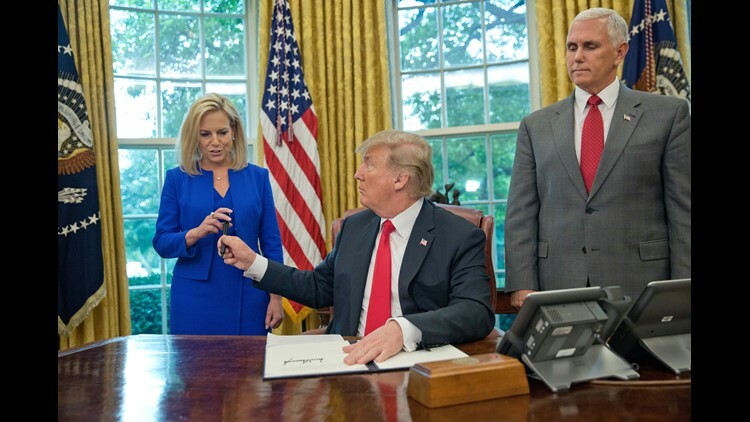 President Donald Trump gives the pen he used to sign the executive order to end family separations to Homeland Security Secretary Kirstjen Nielsen. WASHINGTON — In signing an executive order Wednesday, President Donald Trump said he was ending the practice of separating children from parents who cross the U.S.-Mexico border illegally. "We are keeping families together," he said. But in the immediate aftermath of the order — which was drafted, signed and posted all within just a few hours on Wednesday — questions arose about what practical effect the order really had. Defense lawyers said they had little idea what the president’s order would mean for the thousands of people who are being charged with minor immigration crimes, the legal reason the administration had given for separating them from their children. Marjorie Meyers, the chief federal public defender in southern Texas, said her office had received no information about how the order would play out. If it means the government is willing to hold people in immigration detention instead of turning them over to be held in criminal custody while the charges are pending, it has the potential to mean the government would not have to detain them separately from their children. But it was not clear if, when, or how that might happen. Federal officials gave differing accounts Wednesday about the fate of children already separated from their parents. Kenneth Wolfe, a spokesman for the Administration for Children and Families, told the New York Times, “There will not be a grandfathering of existing cases." But later, Wolfe's boss said he "misspoke" and that no decision had been made. "It is still very early and we are awaiting further guidance on the matter," said senior director for communications Brian Marriott. "Reunification is always the ultimate goal." Trump's executive order requires the Pentagon to make military bases near the border available to detain immigrant families. But Secretary of Defense James Mattis largely deflected questions about what bases would be available and how the detentions would work, saying he was waiting for a request from the Department of Homeland Security. "We'll see what they come in with. We support DHS and right now this is their lead and we'll respond if requested," he said. "We have housed refugees. We have housed people thrown out of their homes by earthquakes and hurricanes. We do whatever is in the best interest of the country." Two South Texas military bases, less than an hour from each other, could be among the potential sites based on their proximity to the border and ability to house people. Fifi Kieschnick, spokeswoman for Naval Air Station-Corpus Christi, said base officials have not received word about whether the facility may be used to house immigrant families. Kevin Clarke, spokesman for Naval Air Station-Kingsville, said there are no plans to bring immigrant families to the base. Also under consideration: Dyess Air Force Base, near Abilene, Texas; Fort Bliss, near El Paso, Texas; Goodfellow Air Force Base in San Angelo, Texas, and Little Rock Air Force Base in Arkansas. Despite the executive order, the Trump administration continued to push Congress for a long-term fix to the border issues. "Congress needs to legislate," DHS Secretary Kirstjen Nielsen said Wednesday after meetings on Capitol Hill. The House is scheduled to vote Thursday on two competing proposals for a sweeping overhaul of the immigration system: Both a hard-line proposal favored by conservatives and a more moderate bill put forward by House Speaker Paul Ryan would allow Trump to keep prosecuting parents who cross illegally but expand capacity for detaining families so they’re not separated from their children. Neither House bill appears to have the votes to pass. The Senate is considering narrower proposals to deal with the separation of families as a standalone issue. "This is an area where Congress should act, we should have common ground," said Sen. Ted Cruz, R-Texas, the author of one measure that would double the number of federal immigration judges and authorize new temporary shelters for families. The family separation policy had been widely condemned by politicians and the media in Mexico and its southern neighbors. "Separation of families is cruel and inhumane," said La Prensa in Honduras. In Mexico, national newspaper El Universal likened the treatment of migrant children to that of terrorists: "The United States treats migrant children as Taliban." Still, the issue continues to not get the media attention it has gotten in the United States. In Mexico, coverage was overshadowed by the soccer team's upset win over defending world champion Germany in the World Cup. Conspicuously missing from the coverage: Any warnings of the dangers of entering the U.S. with children — the deterrent that some proponents of the family separation policy had hoped for. Contributing: Brad Heath in McLean, Va.; Julie Garcia and John C. Moritz in Brownsville, Texas; Javier Arce in Phoenix; and Eliza Collins, Deirdre Shesgreen and Kevin Johnson in Washington.